Essex is located in the East of England, neighbouring London. Essex boasts the longest coastline in England as well as picturesque countryside and towns brimming with life. There is a wonderful collection of old and new, and Essex manages to combine modern facilities, fascinating towns and villages with ever-changing coastlines. 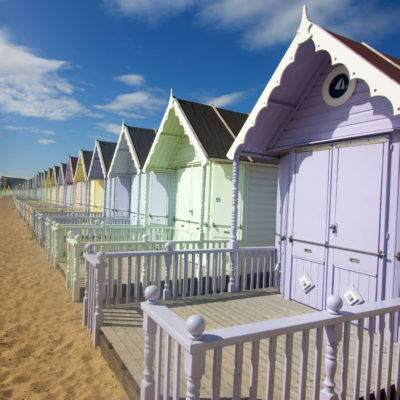 Boasting over 350 miles of golden beaches, the longest shoreline of any county in England the Essex coastline is worlds apart from the hustle and bustle of the London located less than 40 miles away. It is place of surprising wild beauty, ragged coves and inlets, rich in wildlife and sprinkled with history and hidden cultural gems. Read the Discovery Coast guide produced by Visit Essex to find out more about the varied coastal towns, things to do and coastal walks the county has to offer. With one of the driest climates in the UK, the Essex Countryside is perfect for adventures, exploring or relaxing walks and there’s plenty of it with over 70% of Essex being rural. Famous villages and towns such as Tiptree, Maldon, Dedham and Colchester offer varied activities and scenery with culinary delights from Maldon Sea Salt and Colchester oysters, to Tiptree jam. Read the Rural Essex guide produced by Visit Essex to find out more about activities and days out in the county. Chelmsford is Essex’s only City and is only a short 35 minute train ride from Central London. Chelmsford hosts a fantastic events programme including RiZE Festival and 3foot People Festival. Other cultural attractions include Chelmsford Cathedral, Hylands House and the Chelmsford museums. Chelmsford is also home to the Essex County Cricket Club, one of the many sporting venues located in the city. With excellent shopping facilities and a wide choice of food and drink venues there is something for everyone in Chelmsford. To find out more about places to visit and things to do, please click here.